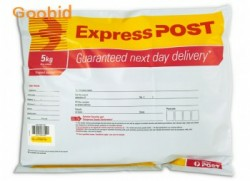 Express Post satchels are the ideal choice for delivery of your urgent items. Items are delivered next business day*, within our extensive defined network, for a fraction of normal courier charges. 5kg Express Post satchels are for items weighing no more than 5kg. Prepaid Parcel Post satchels offer you a convenient, no-fuss way to send parcels anywhere within Australia. You can also use the Registered Post service in order to receive proof of posting^ and Australia Post will capture a signature on delivery for your item. When it comes to sending your parcels with Parcel Post, we aim to deliver your items within 1-5 working days. We encourage you to check with your local post office to confirm regular parcel delivery times. Once correctly addressed, simply drop your Prepaid Parcel Post satchel into a red street posting box or hand it in at your nearest post office.